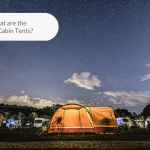 Lately, camping has become more popular, specifically among young adults and teenagers who are not interested in having organized trips, but who want to head out on an adventurous trip that is more nature-friendly. Instant tents have become a favorite among this age group who want to explore the greatness of nature and just kick back and have fun with friends and family. 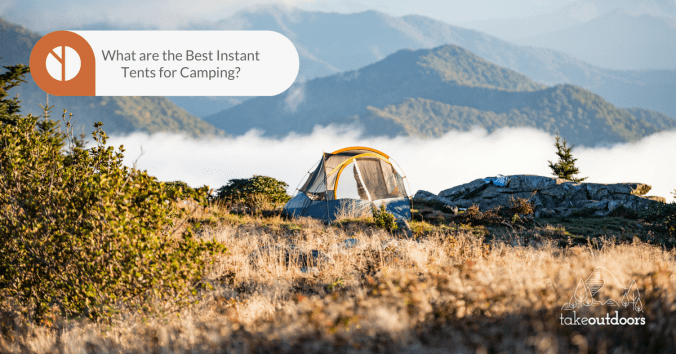 Here are a few tips on what to look for in an instant tent and a few reviews to help you start your search for the best instant tents for camping. So, what type of camping will you be doing? Will you be taking your tent backpacking, go on an expedition, mountaineering, or are you planning on going car camping? 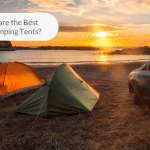 If you are car camping, it will be easier to transport a tent to the campsite so you can get something that is more comfortable and functional. If you are heading out on an expedition, you will need a very durable tent that can withstand harsh weather conditions like heavy rain or that can be set up easily on difficult terrain. Many of the tents on the market are good for three seasons that include fall, summer, and spring. These types of tents are constructed so that they can take some heavy wind, but not snowy conditions. The walls are usually made of mesh which is good for both protection and ventilation. In comparison, a four season tent has a tougher fabric with sturdy poles, and they are usually boulder shaped to shed snow and the wind, plus they feature large vestibules for storing your gear. When you are packing your tent into a backpack, you really need to consider the weight of the tent, so your backpack can be as light as possible, usually less than five pounds. If you are carrying your tent in your car or with help from others, a heavier tent will be more feasible. You will notice that the higher quality backpacking tents use aluminum poles in their construction that are light, strong, and easy to replace if needed. Inexpensive, light-duty tents often use fiberglass poles that are more affordable but less durable and a lot heavier. For the best quality poles, you will want poles made of carbon fiber that is really strong and lightweight, however, they aren’t as durable as the aluminum poles. This is a simple, lightweight, and inexpensive tent that has a sloping wall that doesn’t leave a lot of room for your head and elbow. The A-frame is generally recommended when you have peaceful and calm weather conditions. This type of tent uses a ridge line, a center hoop pole, or curved sidewalls to provide more interior spaces. It is also more stable than an A-frame type of tent. this type of tent varies quite a bit with its many sizes and shapes. This is a very common tent due to its arched ceilings and roomy interior space, plus it is very durable in the wind. This type of tent has a very specific weight, and it is weather resistant. The one negative of this type of tent is their need for proper staking so that they stand still and develop their shape. This type of tent is normally bigger due to its center pole, and that it is staked on the side to create a pyramid shape. It is durable and gives you a lot of space, but it doesn’t have a bottom to keep out rain during inclement weather. This type of tent is similar to the shape of the roof of your house. It is aerodynamic making it lower at the foot and higher at the head with the interior space narrowing somewhat at the head. 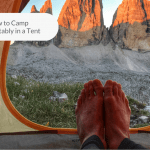 Depending on the number of people you intend to sleep in your tent, you need to make your tent is capable of handling that number plus have a little more area for all of your gear. Also knowing your height and the height of your guests will help you find a tent with plenty of headroom. 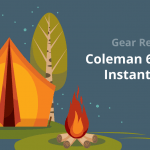 When you are ready for an adventure, the Coleman Instant Cabin Tent is ready to hit the trails with you. This tent can easily be set up by two people just by unfolding it, extending and securing the poles. It is large enough for two queen-sized airbeds and interior storage pockets for your personal items. If you are used to normal dome tents, you will appreciate this modified shaped tent that offers lots of space and headroom. It measures 72” x 108” x 120” inches, and it can comfortably sleep six campers. It is a little on the heavy side, but it is a breeze to set up in less than sixty seconds with the pre-attached poles. The Coleman Instant Cabin Tent has very durable wall and a roof with additional weather protection components. It is made with water repellent fabrics and all the seams are double-stitched. The tent is also easy to pack up into an expandable carry bag with an included rip strip. 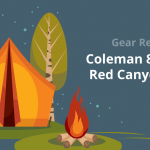 Overall, the Coleman brand is well-known in the camping industry and this easy to set up tent features many Coleman components. The preattached poles make it a simple tent to set up, and it can comfortably sleep six campers. With a lot of space and headroom, this is a great tent for that next adventure out into the wilderness. When you are ready to take shelter on your camping trip, you want a tent that will set up in mere seconds. With the Ohuhu Instant Dome Tent, all you have to do if find a perfect spot, unfold it, and pop it up onto the four supporting struts and you’re finished. This is a three person tent that includes an integrated rain fly for inclement weather, so it is ready to protect you from rain the moment the skies open up. The watertight nylon base of the tent has been treated keep you dry and comfortable and this lightweight tent only weighs 7.5 pounds which fit perfectly into your backpack. This waterproof and UV protected design will keep you protected from the worst weather and a great ventilation system will keep you feeling cool in high temperatures. This tent fits three comfortably but can be cozy for four. This large capacity tent also includes ceiling hooks for hanging a lamp and interior pockets help keep your personal items safe. This is a super easy tent to set up and take down. With its eight steel pegs and four ropes, it is also very sturdy. The detachable rain fly keeps you dry when the clouds roll in, but it can also be a great shady spot if you’re at the beach. Overall, this is a great little instant tent that is lightweight and easy to take anywhere. It’s integrated rain fly helps protect you from both rain and the sun, while the treated nylon base will protect you from any leaks. This tent is easy to carry to your camping spot and ready to pop up in seconds when you are ready to go to sleep. If you enjoy using the latest technology, why not check out the latest in outdoors tent technology? The CORE 4 Person Instant Dome Tent can easily be set up in 30 seconds with pre-attached poles that simply unfold and extend. The Core H20 Block Technology mixes active beach technology with water repellent fabrics, so that water just runs off. The rain fly is removable so that you can expose the mesh windows and ceiling when the weather is warm. There is also an advanced venting system that utilizes an air intake vent that is adjustable that will draw cool air in from the ground. The mesh ceiling lets the hot air leave the tent keeping you comfortable in any season. Zippered privacy panels are available on the doors and windows. The tent fits four people and one queen air mattress comfortably. There is also plenty of room for your gear in the gear loft that also includes an storage pocket and lantern hook plus an electrical cord access port. Overall, this is a stress-free tent to set up with pre-attached poles that just unfold and set up. Fitting up to four people, the CORE 4 Person Instant Dome Tent is made of water repellent fabrics and features doors and windows with rain resistant seals. This is a well-ventilated tent that is also lightweight and very functional. If you are looking for a durable, reliable, and quick to set up tent, the Ozark Trail tent is worth a look. This Instant Cabin Tent can sleep six people and can be set up in just sixty seconds. Pre-attached steel poles provide sturdy support for the spacious Ozark 6-Person Tent contains three windows and can fit two Queen-sized airbeds. Measuring 10′ x 9′, The Ozark Tent comes equipped with a sturdy and durable rain fly featuring factory-sealed seams that keep out water, and a welded tub floor keep insect from bothering you. A free-standing frame allows for the most space without the need for central support pillars, plus it has electrical cord access and includes tent stakes and a carrying bag. Overall, the Ozark Trail tent is an easy to set up design that fits 6 people comfortably. It features a spacious interior with a durable rain fly that will keep everyone dry. The Ozark Trail Tent is a good option if you are heading out to camp with the family or a few friends and it has a simple and quick tent set up that is complete in just sixty seconds. The clear winner of the best instant tents roundup is the CORE 4 Person Instant Dome Tent. This tent can be set up easily in just thirty seconds using the pre-attached poles that you just unfold and extend. It also features Core H20 Block Technology that joins active beach technology with water repellent fabrics, so if you are caught in a rain storm, the water will just run right off the tent. The removable rain fly allows you to enjoy a nice breeze when you have warm weather, and the mesh ceiling allows hot air to flow out while the advanced venting system draws cooler air from the ground to help keep the tent comfortable no matter what the temperature outside. The definite winner of the best instant tents roundup is the CORE 4 Person Instant Dome Tent.